So How’s That Vegan Thing Going Anyway? Rumpy is not pleased. He misses bites of tasty morsels as I noshed to my heart’s content. Last week I was checking out at the grocery, and the kid ringing me up asked if someone in my home had a dairy allergy. I said no, this way of eating is a choice. It’s a choice that I make every day. Do you know what a struggle it can be to find something to eat besides a salad in many restaurants around here? Fast food? Sure, I can head to Subway for a veggie delite (no cheese, please). Otherwise I pack a peanut butter sandwich if it’s going to be a busy day. And while some say cheese is their greatest struggle, for me it’s been to find a coffee creamer I can live with. I look forward to my morning coffee. I find it a comfort as well as a pick-me-up. I’ve toyed with the idea of giving up coffee for awhile now, but I’m not ready to do that. Both taste and mouth feel of a creamer are important. I like the mouth feel of Silk soy creamers, but the stores around here only carry the flavored creamers, and whoa! 3 grams of sugar in a TABLESPOON? Are you kidding me? You learn real quick that the label Vegan does not equal healthy. The others I’d tried simply didn’t have the mouth feel I was looking for. Until I found Nutpods. Ah, the ingenuity of the human spirit! Nutpods is a blend of almond and coconut, has a creamy texture without tasting like a coconut, and has no added sugar. The downside is I had to buy this through Amazon because no store around here sells this product. Fortunately it doesn’t require refrigeration until the product is opened. Don’t like French Vanilla? They also have unflavored and hazelnut flavored options. As for food, I’m eating well. Here are some photos of recent meals. Links to the recipes are at the end of the post. 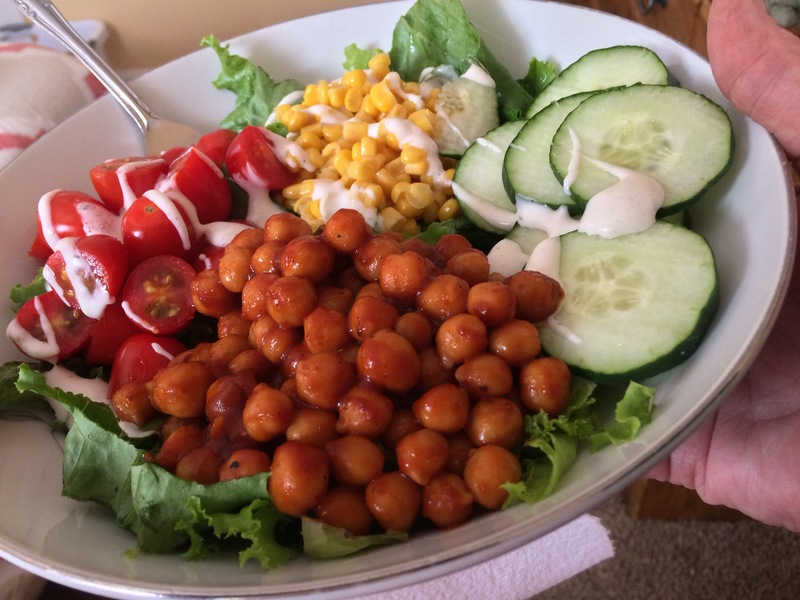 Barbecue Chickpea Salad- yes, it really is as good as it looks! “Steak” and Stout Pie. Vegan comfort food at its finest! 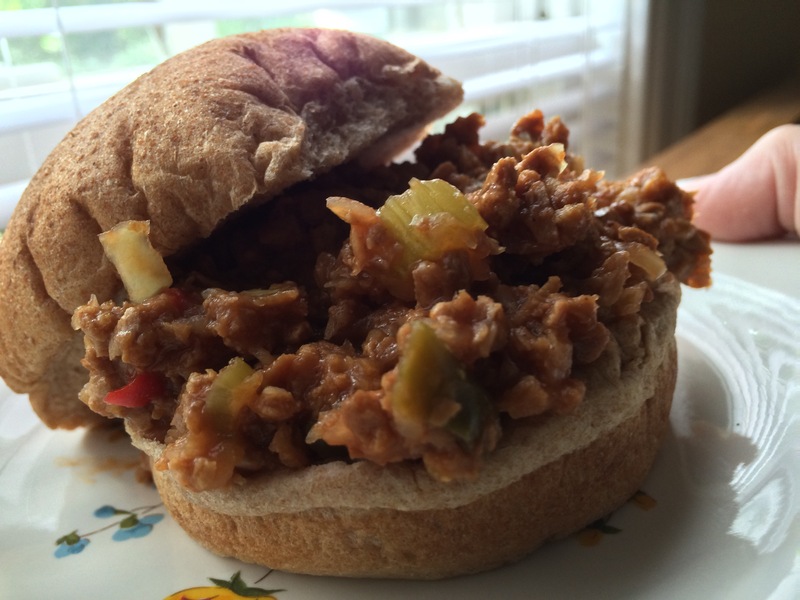 Sloppy Joes with equal parts vegan burger crumbles and cabbage substituted for the meat. Cabbage Sloppy Joes-just use your favorite recipe and sub equal parts veggie burger crumbles and cabbage for the beef. The recipe I used called for 1 cup ketchup. Ketchup has a lot of sugar, but I bought the low-sugar kind so it wasn’t so bad. I noticed your photo posts of nice meals, and the salad was especially appealing, on Facebook. I sadly must have missed a great deal prior to this blog post. Am I right having the impression that a vegan diet is something you have recently embraced? I think I would have a really hard time with coffee creamer too. I have never heard of “Nutpods” before. I would love to have a conversation with you sometime (if this is a relatively new thing for you) about what led to the decision to follow a vegan regime. Health? Personal reasons re” animal welfare? Sustainability and local economics? And it would be a conversation not based on judgement on my part, but one of seeking knowledge. Someday I should buy the “crumbles” to see how they hold up taste wise and cooking wise, compared to ground meat. I’ve never been especially fond of garbanzo beans, but the BBQ for the salad interested me. Do you also have to do a lot of label checking for condiments? Anyway…I hope my comment wasn’t too intrusive or silly. Thanks for sharing your going vegan journey. I recently had my cholesterol checked and it was higher than it has been. Still in the normal range and I want to keep it that way. If my cholesterol goes down it will be worth it! We each make our own choices. I may choose to eat differently tomorrow. I don’t eat eat and the dogs have survived without the taste of the real thing. I do like veggies and they are the largest part of my diet. I am a purist when it comes to coffee. There is no milk involved at all. I don’t drink milk or any of the other additives that people use in their coffee. It has to be black and strong. I weight less today than I did in elementary school. I must be doing something right. My biggest problem is cheese, but I’m glad to see an alternative for Creamer, I was looking for one! My favorite cheese is Follow Your Heart. I couldn’t do what you’re doing. I like meat and sea food and cheese. What about Rumpy and the cats, can they have meat in his food? Yes the animals eat meat. I like not having to spend the rest of my life on cholesterol meds, so to me it’s a small price to pay. Great job, Jen! So glad the choice to go Vegan is going well! Those BBQ chickpeas look delish! perfect description of vegan life! That all looks yummy! I can recommend Dreem rice milk (the original one, though they do an organic one with added calcium too) It tastes really good, like full cream milk – it took me a while to get used to it as I’d been drinking semi-skimmed milk for years. It’s low in fat, similar to semi-skimmed milk I think. The “milk” comes in flavours too, chocolate and vanilla I think, and they make ice cream though I’ve not tried that. All thee food looks so yummy!! Mee goin to show LadyMum yur bloggie…..
Rumpy dog maybe there are doggie Vegan foodss you could eatss??? As a vegetarian, my only question is what time is dinner? 😉 Everything looks delish! Glad you found some creamer you can use. On that front, I have used (and eventually got used to) soy milk but decided animal protein was superior to GMO products. If it’s not one thing, it’s something else. 😦 Good luck. I’ve literally been searching for a creamer that works as I am also a big coffee fan! and turning vegan that as also been my biggest struggle. So will definitely check this brand out! oatly barista is suppose to be a good shout as well! Haven’t heard of that brand. I’ll check it out. Thanks!